A few days ago, I came across something about a movie due in theaters in a few weeks called The Meg starring Jason Statham, Li Bingbing, and Rainn Wilson. 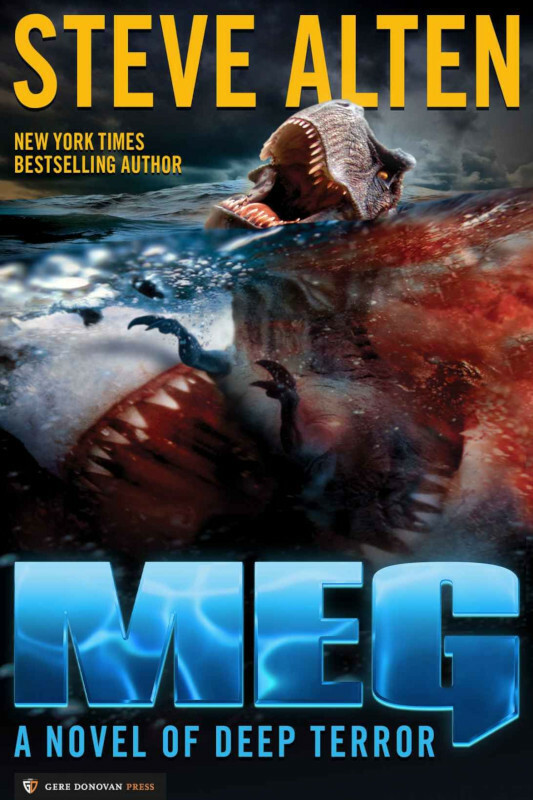 It’s based on a 1997 novel written by Steve Alten called Meg: A Novel of Deep Terror. Yes, it’s about a shark, but an extinct species called Megalodon, something about the size of a school bus, but a lot meaner. I doubt I’ll go see the movie, but curious, I found the first novel (in a series of five) at my local public library. Not to sound cliché, but it is a real page turner. One of those “I can’t put it down” novels. Our hero is paleontologist Jonas Taylor, a former deep-sea diver and marine biologist who, after a brief encounter with a Meg fifteen years before, and having caused an accident that caused the death of two Naval personnel, has never been able to get into the water again. His ambitious, career-minded wife has written him off as a failure and is having an affair with his millionaire best friend. In spite of the more “soap opera” aspects of the book, which fortunately are held to a minimum, the story is full of “pulse-pounding action,” and, as far as I can tell not being a shark, ship, or submarine expert, seems to be full of pretty accurate and well-researched material. Of course, Jonas is lured back into the water, back into the deepest part of the Mariana Trench, and yet again is confronted by a Megalodon, actually two. Due to a complicated and highly speculative set of circumstances, the larger female Meg is able to get across the band of cold water that has kept her species at that depth for the last million years or so, and get to the surface. Kept from attacking during daylight since her eyes are adapted for almost total darkness, and emitting an eerie pale glow, the Meg proceeds to create a reign of terror that Peter Benchley’s “Jaws” would have wet dreams about. It’s the attention to detail and wave after wave of action that kept my attention, and even when the Meg wasn’t shredding whale, shark, and human flesh, the ominous tone of the more “peaceful” chapters kept me moving forward in the story. The longest chapter involved a converted Navy ship, a forty-year-old nuclear submarine, a helicopter, and the Meg herself, however, it was the climax that actually made me impatient to see how Jonas was going to get out of the horrendous mess he got himself into, literally inside the stomach of the monster. A few parts of the book felt a little forced, but over all, Alten told a definite “Amazon five-star tale.” I seriously doubt the movie will come close to this level of entertainment, and if it did, I’d never see it because it would scare the daylights out of me. I can only imagine though that the upcoming movie will spark new interest in this and the other books in Alten’s series. Sounds right up my street James. I’ll look out for it. Glad I could pass along the news. I’d like to watch this… but maybe after a drink or 3…. so I’d be too drunk to be scared. Or …..I’ll just stay home. A good review. Thanks, Vivian. It’s easier to read the book, I think. Also, the copy I reviewed was the original 1997 edition. In preparation for the movie, the author released an updated edition padding it more, which some reviewers didn’t like at all. I should have guessed you’d say something like that, PL.